The fact that the North Koreans have tested their third nuclear device has been widely reported, but I haven't seen much scientific analysis of it yet. Many of the headlines have been bumped by tonight's State of the Union address, which is understandable. Aside: Watching the State of the Union address can be fun, but it can also be excruciatingly slow. You can usually read the entire speech in less than 10 minutes the following morning, but that misses the whole pomp and circumstance of the thing. End aside. What is on everyone's mind is, How Big Was The Boom that the North Koreans made? I think it was big. Here's my guess, up front, and I'll spend the rest of the post explaining my answer: 20 kilotons. 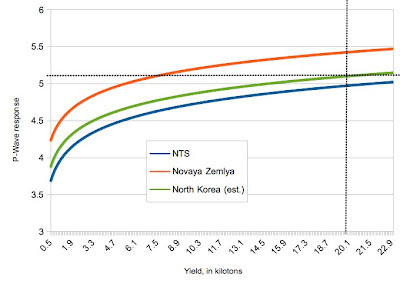 I realize this is significantly larger than the South Korean (early) estimate of 6-7 kilotons. This also puts it larger than the 16 kilotons estimated by Wikipedia for Little Boy but smaller than the 21 kilotons estimated by Wikipedia for Fat Man. The pressure wave from the blast made it look like a 5.1 magnitude earthquake. The location is very close to where the other two devices were exploded. The 2006 explosion, estimated to be 1 kiloton or less, was a 4.1 magnitude earthquake. The 2009 explosion, estimated to be 2-6 kilotons, was a 4.5 magnitude earthquake. The design of the weapon. Was it all plutonium? Was it all uranium? Was it some mix? The precise rock / sand / water makeup of the mountains around the test site. The fact is, post-detonation, it's actually hard to tell "How Big Was That Boom?" The Grainger catalog, for instance, doesn't sell a "Boom-O-Meter" to tell you how many kilotons your blast was. You have to derive it. Seismic instruments can measure the P-waves and S-waves and can make an educated guess at the moment-magnitude scale (more commonly, albeit imprecisely, known as the Richter scale). This is an estimate of how much power was transmitted to the earth in an earthquake, or in a nuclear explosion. These scales are logarithmic: a magnitude 5 quake is 10 times larger than a magnitude 4 quake. What's critically important is the coupling factor: how well does the energy of the bomb couple with the earth? At the Nevada Test Site, where the US has done much of its nuclear weapons testing, the coupling is pretty weak. It's sand. The bomb goes "boom" and a lot of the sand shifts. In general terms, even a big bomb only makes a small "thud" in the earth. Contrast that with the primary nuclear weapons testing site for the Soviet Union: Novaya Zemlya. It was the site of 224 tests, and it's a giant rock. Here, even a small bomb makes a big "thud" in the earth's mantle, which is carried around the world for seismic devices to pick up. Key fact #1: the 2009 test was a 4.5. The 2013 test was a 5.1, from roughly the same area. If the coupling is the same, the 2013 event was 4 times larger than the 2009 event. Thus, if the 2009 event was estimated at 2 to 6 kilotons, simple math means this was an 8 to 24 kiloton event. where A and B are empirically determined constants. The horizontal dotted line is at a magnitude 5.1 quake. At Novaya Zemlya (red line), since it's a giant rock and well connected to the earth's mantle, the black line crosses at 7.5 kT: a relatively small boom can make a big kick in the earth. At NTS (blue line), it's all sand, and it takes a very large boom (something like 29 kT ... off the chart here) to make a 5.1 magnitude quake. We don't know the exact rock makeup of the area that North Korea uses for testing, so we have to guess. The guessing is also why the estimates for the 2009 event are between 2 and 6 kT ... we know the ground is not as squishy as NTS, but probably not as hard as Novaya Zemlya. Hence, 2-6 kT for the 4.5 quake in 2009. 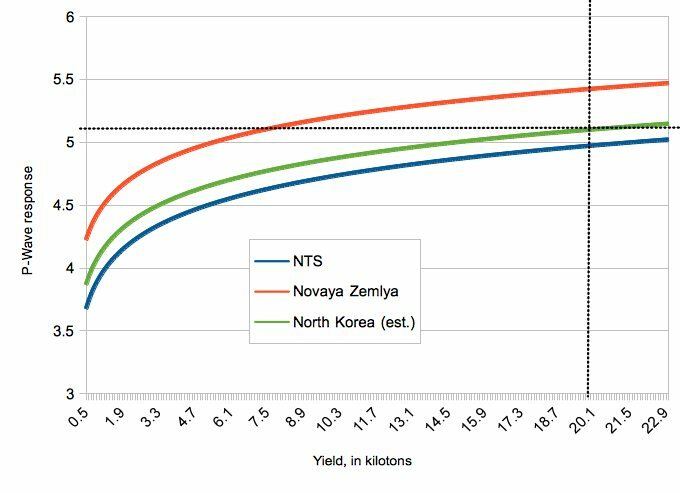 The green line is my North Korea estimate, based off of previous estimates for Pakistan. I will note that the green line estimate also lines up with the reported size of the 2006 test (1 kT or less for a 4.1 quake) and the 2009 test (2-6 kT for a 4.5 quake, and I show 3.4 kT); however, there is a lot of uncertainty there. One could draw a few other green lines that also match the reported data ranges. But this one is big. Bigger than has been reported or hinted at previously. Lastly, the Comprehensive Test Ban Treaty Organization (CTBTO) has probably been going full-on for the past week or so. This is the stuff they live for -- to detect nuclear explosions around the world, by whatever means necessary. They picked up the blast; they're now sniffing around the world for xenon-133, in the hopes that some of it escaped from the mountain after the blast. Xe-133 is a fission product and is not normally found in the atmosphere; it's a telltale sign that someone has been doing some fission recently, and since it's a noble gas, it can leak through a lot of things. Clicking on the above picture will take you to a 11MB movie that shows some modeling results of the 2006 event and how they think they detected the Xe-133 from it -- all the way in Yellowknife, Canada. Jump to 1:40 to see it. Unfortunately, the 2009 event was buried deeply enough that no Xe-133 was detected ... at least, not by the CTBTO. For more reading: see Caging the Dragon, available as a pdf.